"Though 1962 will be remembered as the year R/C Scale came of age, it is also the year which saw fine improvement in C/L scale." That statement was made nearly 50 years ago. At the time, the number of channels for an R/C airplane was counted as double; up and down elevator was 2 of the total channels. So, when you read about Joe Martin's 10-channel Boeing XB-47D, it does not mean the same as it would today, where channels above 4 implies retracts, flaps, bomb drops, brakes, navigation lights rotating turrets, etc. The article boasted 26 models entered - about the number of backup models the typical national-level modeler brings to each event today. Worth 1,000 words is this pix of Joe Martin and his radio controlled Boeing XB-47D 10-channel 78" job! 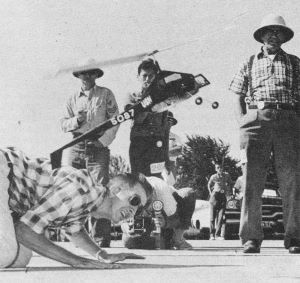 Top Helicopter flyer was Glenn Lee with modified "Square Eight"; original rotor system; Fox 15. Riley Wooten gets his "Sneaker" airborne in the Combat circle to win Open. 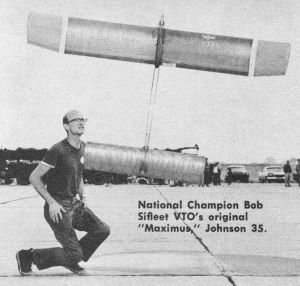 National Champion Bob Sifleet VTO's original "Maximus" Johnson 35. Experimental geared Torp had 1.5:1 Boston spur gears. Junior Jim Skarzynski who took Championship, holds his 1st place Stick; took Cabin 2nd. 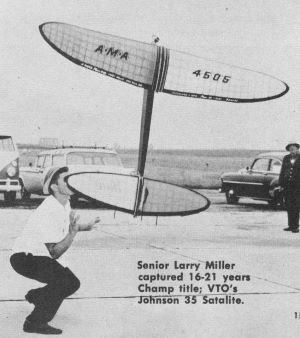 Senior Larry Miller captured 16-21 years Champ title; VTO's Johnson 35 Satalite. 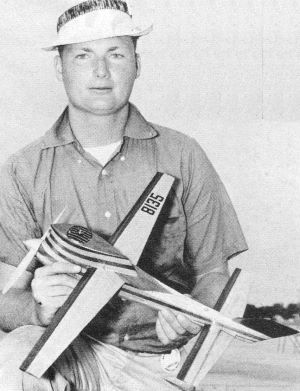 Bobby Brooker (lt.) and Billy Graham (pilot) from Dallas took CL A Speed; original; Super Tigre 15; 138.09. First, Free Flight Scale Open: Bucky Sevaites with Curtiss Hawk P1B; Cox .049; scaled 1 1/2" to foot. Nice follow through: Tom Neuman and indoor microfilm covered Cabin entry which won 1st Senior event. 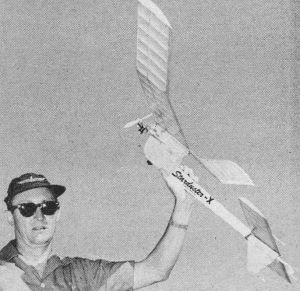 Winner of Testor Best Finish Award was Ted Prasol; his control-line Piper Tri-Pacer placed 4th in scale event, too; from Berkeley plans, 44" span, Super Tigre 23. 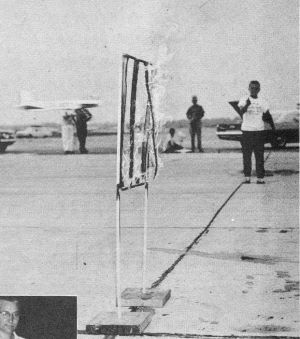 First in ready-to-fly plastic plane Balloon Busting category was Ralph Miller seen cracking the flaming barrier. 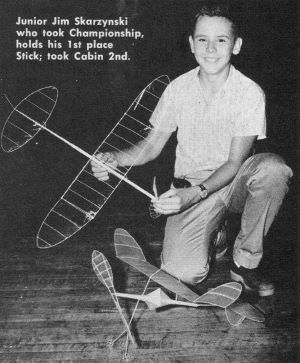 Top Stunt control-line pilot was Gerry Cipra, 14, with a modified Nobler; Fox 35. Took Jr., then the Walker fly-off. First in CL C Sr. 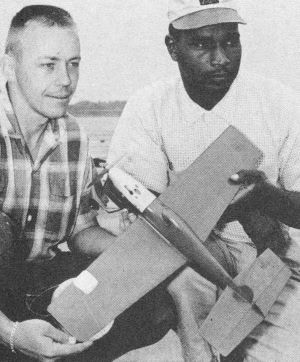 Speed was Bob Violett, original plane of laminated hard wood; McCoy 60; 152.87-mph. Robert Champine was 1st in Open Cabin; Duke Fox helped wind. 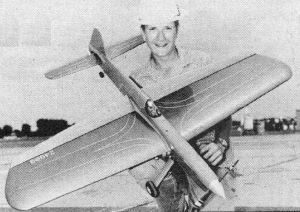 Jerry Worth with P-26A, 1st in Open C/L scale; 42" span; 6-lb. With the finest array of scale models ever seen at a contest, the talk of the Nationals was the amazing performance by R/C entries. Flown for the first time under a new set of rules which required a qualifying flight before scale judging, twenty-six models, only two of which were alike, were flown. Nineteen completed flights. Strong gusty winds made conditions far from ideal, yet the models flew and flew well. Free flight, though exhibiting the usual trim difficulties, also produced several fine models paced by the Servaites P-1B in Open and the Lambert L-19 in Jr/Sr. An unexpected pleasure was the fine flying of the usually beautiful C/L models. Failure to mention the jewel-like perfection of the Testers award-winning Piper Tri-Pacer by Ted Parsol would be amiss. We also noted the fine flying trim by the P-38 of A. Alberron who came from Mexico. Due to a take-off mishap its elevator was knocked off, yet it completed five smooth laps before faltering. Though 1962 will be remembered as the year R/C Scale came of age, it is also the year which saw fine improvement in C/L scale. - LeRoy Weber, Jr., chairman, AMA Scale Committee. Contrary to reports you may encounter elsewhere, the '62 Nats were not held on NAS Glenview. They were off NAS Glenview ... at least the first three days of free flight! Fast drifting breezes made Class B gas, Unlimited Rubber and A/1 Towline pretty much of a retrieving contest. It took darned good flying to win. But if you didn't get out there and hustle to get your ship back - you didn't have a chance to show what kind of a total you could make. Take Open B gas, f'r instance. 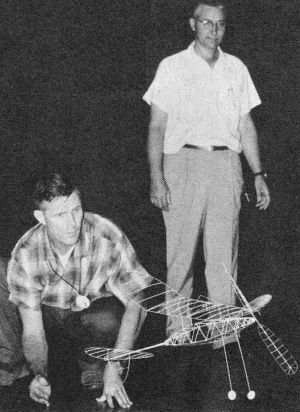 Two fellows put in a string of three 5-minute maxes to go into a flyoff: Jerry Comp, a Bell telephone installer from Philadelphia, and "Red" Kleinfelder, a high school physics teacher from Middletown, Ohio. The event winner, Comp, said he was real lucky, his Fox 29X Starduster 900 d/t'ed down next to a road on each of his three official flights. Kleinfelder, on the other hand, had to go up a tree once; on another retrieve he had to sit on the shore of a lake until the wind blew his 700 square inch Spacer in to shore. A mere 6 seconds separated the pair on their flyoff - though both were well under maxes. That was Tuesday. Wednesday and Thursday were even breezier for 1/2 A and A Gas, Rocket, Nordic A/2. Then it calmed considerably for Friday, which was FAI Power and Hand Launched Glider. Made it a real pleasure for most people. Saturday came Wakefield - and a typical Wakefield weather prediction, "Occasional rain." But if you got out early, conditions were quite calm. Then it did rain. Sunday was less wet but not much lift. Oh, well, just wait till next year...! Mechanics, helpers, gear-toters, call 'em what you may, who is to say but what they have as much fun at the Nats as anyone-and without the butterflies! Nats helpers are recruited from fellow club members, neighbors and families. In the families of contest-minded modelers, it seems that at least a part of the group's vacation is allotted annually to attending the Nats. Anyone may thus fall into the helper's slot, fathers and mothers, sisters and brothers, wives and daughters. Speaking in behalf of the latter, Donna Cullin, 18, daughter of Randall Cullin of Trenton, Mich., says that she has been her father's Nats helper for several years and wouldn't miss the fun and excitement for anything. Her father is an ardent speed man and is still flying the same original model with which he won a second at the '57 Nats. At home,. he drives over to Detroit to practice at the $7,000 speed circle at Rouge Park, built recently by the city Park and Recreation Department. Sometimes guests just don't realize the amount of time that their host may spend in preparing for their visit. In general, Nats visitors aren't that way, they appreciate the tremendous effort made by Naval personnel on the modelers' behalf. But, did you know that almost all Glenview's personnel draw extra duty chores for the Nats? Mechanics become kitchen help, typewriter pounders, nail pounders, traffic directors and etc. & etc. In addition, the Navy annually "imports" about 40 specialists from other stations throughout the nation. These men work on the air-model championship every year, and are recognized as Nats specialists. Some conventional, some whimsical, some impromptu improvisions, some nostalgic - such were the categories of head-gear displayed at Glenview July 23-29. The more orthodox caps, Bahamas straws and sun helmets went unnoticed in the display of unusual items. Bright colored club emblems advertised groups from New Jersey to California, as did jackets, shirts, flags and model carriers. Also to be observed were unusual creations such as kit Frankenstein monsters bobbling atop crash helmets and hats sprouting wings, glow plugs, propellers and other modeling paraphernalia. Perhaps the most nostalgic of the lot were the two sun helmets sported by Walt Billett, that old-timer from Minneapolis. Each of his headpieces originated at previous Nats held in Dallas ... the 1956 model is painted blue and the 1960 is white. Both feature outstanding modelers' autographs in many colors of dope. These were all headpieces displayed by men at the Nats. The feminine chapeaux department is dull by comparison. Who'd notice a conventional fruit bowl compared to a green monster staring you in the eye? Many Nats contestants say that the take-off from home for the big event always seems to come in the wee small hours and after a frantic work session and rushed packing spree, of course. So in the mad scramble to get away, what items are most frequently forgotten? 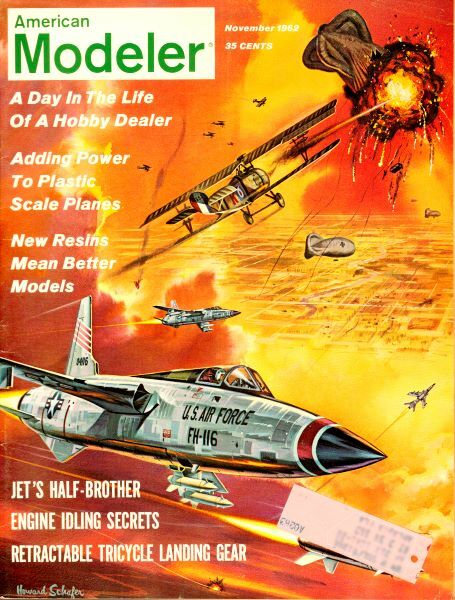 The hobby store operators in the workshop hangar pondered this question, then agreed most-oft-forgot were batteries, followed by control lines and fuel. 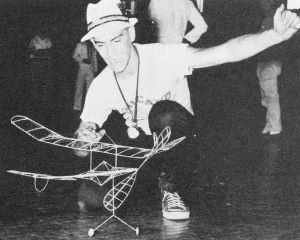 Although not often among the forgotten items, props and balsa are naturally big sellers. And, on Saturday, that l-o-o-n-g rainy day, they sold more than 1,500 hand launch gliders, most of which were quickly assembled and heaved toward the workshop rafters. Once again Air Youth Champs traveled first class to the glamorous National Meet for their big fly-off. New grand champ is David Fox, Springfield, Penna., who won the AYSC endurance vent and took second in its speed category. Other AYSC event winners: Beauty - Lin Yau Farm, Jr., Honolulu, Hawaii; Speed - Tom Hunter, Rock Hill, Mo. ; Stunt - J. P. Murray, Odessa, Texas. The 1962 AYSC Nationals drew 22 State Champs - what happened to those other 28? Florida sent Evelyn Whitney, only girl contestant ... so watch out boys! The "Confederate Air Force of Alaska" sent Mike Simmons, age 9, who became the big spender of the meet by bankrupting himself the first day. Mike also garnered the help and affection of everyone at the contest. Other flyers took up a collection to replace his busted-up model entry. Our two new States came on strong. Hawaii once again sent a shy, handsome and very capable flyer, Lin Yau Farm, Jr. 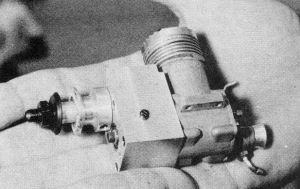 Most AYSC entrants flew kit models with a wide selection of engines sizes and makes. 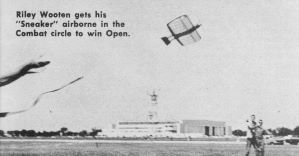 Several original designs included a twin-boomer flown by Robert F. Jones, Indiana and a lightweight with full flying tail (stabilitor) by Robert H. Nilsen, West Virginia, which unfortunately came adrift in flight. Karlon Ahlquist, Wis., flew a beautifully finished swept-wing design. This year's AYSC entrants showed good level of workmanship, engine management but stunt event flying proved to be a toughy for many. 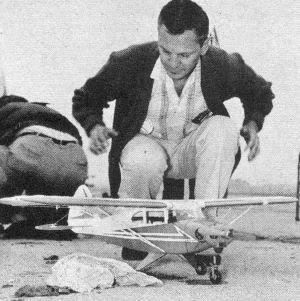 Weather was fine during the flying session and the AYSC fly-off was smoothly and very capably directed by Gosta Johnson and other members of the Chicago U-Liners Club. AYSC was a fine contest-within-a-contest again. Where, oh where, the models to stow? There was hardly a Nats contestant untouched by the problem of how to transport his or her fragile brainchild across country and have it arrive in Chicago in good flying condition. Some modelers hammered together packing cases and shipped them ahead, some trusted the trunk of the family car, some, lucky ones had station wagons and only two passengers. Others rented or constructed car-top carriers and a few ambitious individuals and clubs made trailers. One of the most impressive of the individual projects was the snappy green trailer turned out by Mr. and Mrs. J. D. (Margaret) Jerguson of College Park, Ga., and for less than $100, too. They began with a Crosley chassis. To this they added a plywood trailer frame with 4 x 6-foot base. Both sides of this box open full width and can be propped by telescoping aluminum poles, of which there are four. The tarp, which covers the trailer in transit, can be combined with the aluminum poles to make a contest sun shade. Also, the front hitch of the trailer has a bracket for mounting a modified car bumper jack which has a light plane tail wheel welded to its base. And there's another feature - the model carrier rack inside the trailer is secured by two large screws so that the rack can be removed easily to make a camper trailer. What did the Jergusons haul to Glenview in this eye-catching rig - Mom's free-flight models, that's what! 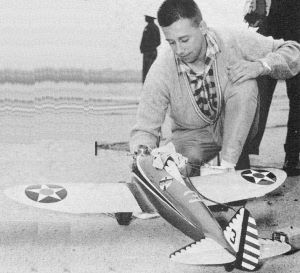 With working three hours a night for a month to make the trailer, Dad never had a chance to get the covering on his R/C project, an Astro Bipe. The Jergusons brought with them three of their four children, plus a junior member of their home model club, The College Park Prop Spinners. Their youngest child, and only son, celebrated his fourth birthday the last Sunday at Glenview... he had his second in Dallas. This was the "year of the twins," with such R/C planes taking the top three places. In front was Californian Bob Doell, flying an 8', 18-lb Douglas JD-ID (Navy version of A-26). Bob used CG 2O-channel superhet R/C, Veco 35's with K&B throttles. It's his 4th twin and he now plans to build a 4-engine type . Most impressive R/C scale ever seen was Joe Martin's 78" span, swept-wing B-47 bomber. 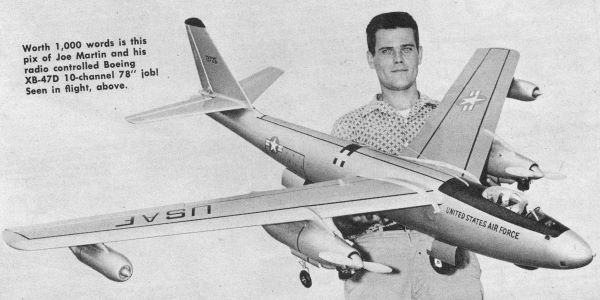 Powered by two K&B .45's, controlled by Min-X 10-channel superhet, this fast (34-oz , wing loading) prop job was scaled from Boeing factory data and a small plastic shelf model. 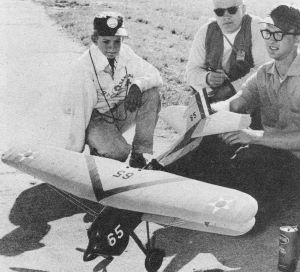 Gliding tests with 18" span sheet balsa B-47's were used to check flight stability and determine C.G. position. 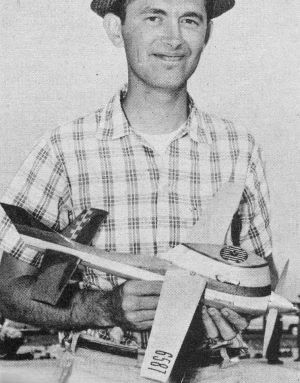 Phil "Mustang" Brietling placed 3rd with a 78" span P-38L Lightning (Orbit 10-channel superhet; two Super Tigre 56's). Phil estimates its top speed at 90 mph - 'tho he only used 3/4 throttle (60-65 mph) at Glenview. These were his first flights with the model! Unlike the first and second place "twins" (which had slight flying surface area changes), Brietling's was exact scale, being based on Roy Weber's P-38L plans in Atkin's Superscale book. Last year's winner, Bill Murphy, had to write off his beautiful, retractable gear Piper Apache when it flicked over on its back after take-off. C/L Scale attracted an enormous entry, with a remarkably high standard of construction. In addition to the usual sprinkling of metal-covered entries, several featured scale metal airframes. Two top Open places went to outstanding conventional wood-construction entries. In first was Jerry Worth's superb Boeing P-26-A (42" span; 1 1/2" to ft.; 6-lbs; O.S. Max 49 R/C engine). The famous "peashooter" presents a real challenge to a model builder's finishing skill - one which Jerry met ably (he's a custom car finisher). Louis S. Casey from the National Air Museum remarked that he'd like to have more models of this calibre for display. Plans are afoot to introduce a non-flying beauty event at future Nats, with winning models being displayed for a period at the Smithsonian. The Nats have seen some fine Dyna-Jet powered entries but never anything better than Ervon Gregory's 3-year old Skyray F4D-1, which placed 2nd in Open Scale in its Nats debut (it had already won 20 first places at other contests). Spanning 32", model was designed from Douglas factory drawings. Its trike landing gear retracted and extended perfectly via electric battery powered motors carried in model. The judges were scratching their heads over nine Mustang F-51H's all from McCroskey-Jetco kit - plus a "twin Mustang" built from two of these kits! Taking a close look at entries in the judging and display cage was X-15 pilot Neil Armstrong (he's flown at 3175 mph and 207,000 ft.), a model builder from way back. Free Flight scale interest sagged with less than 20 entries. Engine starting troubles and erratic flights pointed up inadequate pre-Nats flight-testing by all too many. Building standards were generally high, with several daring choices-such as Open Winner Bucky Servaite's Curtiss Hawk P-1B. Combined Jr. and Sr. went to Rickard Lambert, who flew the same hefty (2 1/2 lbs.) L-19 "Bird-Dog" he won with in '61. More use of pendulum control would do a lot to improve F/F scale popularity ... which was a point C.O. Wright made in his talk at the well-attended "Flying Scale Symposium" held one evening. Other speakers were Harold deBolt, Bill Netzeband, Zel Ritchie and Johnny Brodbeck. Johnny, who unveiled a geared experimental central-shaft K&B Torp, predicted that the next five years will see many radical advances in design of production model engines. Will your club be a four-year wonder? Bill and Betty Bell, well-known husband-wife team from Delray Beach, Fla., who have organized two groups themselves, had this to say of model clubs. Unless you get several dedicated older modelers and a continual infusion of junior members onto your roster, you're apt to have a club that will be a short-lived affair. Say a boy becomes interested in contesting at 13, by the time he's 17, he can be captured by girls and/or cars or is off to college or the military service. And the business demands made on adult modelers these days often put a limit on the number of years a given leader can be expected to give his modeling time to organizational duties. So, keep on selling the hobby, the Bells advise, and keep bringing in this new members - both youths and adults. Genial Johnny Brodbeck of K & B engines was on hand for his fifteenth consecutive year repairing engines for all comers and getting many a grateful contestant back into the fray. This year he was joined by Keith Storey, specializing, in McCoy engines for the Tester Corp. They and their helpers repaired about 225 mills. Business, they agreed, was brisk enough, but below that in Dallas two years ago - when combat was flown over concrete! Cliff Telford won C Speed Open, 167.84-mph; original; mod. McCoy 60; mahogany & bass. 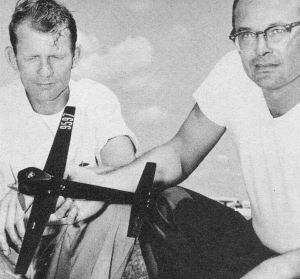 Best FAI Team racers: Don Jehlik & pilot Herb Stockton; orig. ; ETA diesel 15; 28" span. 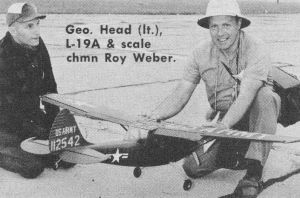 George Head (lt.), L-19A & scale champion Roy Weber.